Posted on January 24, 2019 by Matthew Leib. This entry was posted in Spotlight, Staff Stories and tagged Coaches' Corner, Spotlight. Bookmark the permalink. Crash the boards in support of Huskies Women’s Basketball and Gymnastics with select ticket discounts from UW Athletics! There’s an unforgettable scene in Frank Capra’s 1946 film It’s a Wonderful Life in which a basketball gym floor splits open during a high school dance, sending unsuspecting dancers splashing down into a 25-yard swimming pool below. The uproarious scene was no product of a complex studio staging. The hybrid gym/pool actually existed—and still does—at Beverly Hills High in Los Angeles. While still remembered for its star turn on the silver screen, the marvel of mid-century engineering could easily serve as a metaphor for the career of another fixture of southern Californian sporting life: Jody Wynn, who, since 2017, has served as head coach of the University of Washington Women’s Basketball. A standout high school player who helped lead Brea Olinda High School to three state championships, Wynn went on to start at guard for USC where she and teammates won the 1994 Pac-10 Conference championship and made three consecutive NCAA Tournaments. But beneath the polished parquet and litany of hard-won victories, water ripples. Wynn ascribes her success playing and coaching basketball to foundational lessons she learned as a competitive swimmer from her then coach, Olympian Lori Scott. And she might have become one—indeed, her brother went on to swim competitively at Duke—had her play on court not caught the attention of Mark Trakh, then the high school coach of the local Ladycats team in Wynn’s hometown of Brea. By the end of eighth grade, Wynn says she felt “water-logged” as a competitive swimmer and so decided to turn her full focus to basketball—a game she was fast falling in love with for its sociable qualities and complex elements of teamwork. “I fell in love with basketball playing in junior-high,” Wynn says, adding that Trakh allowed her to play high school varsity league games during the summer season. After a stellar turn as a high school standout, she went on to success as a starter for USC while simultaneously honing her skills as a coach—working with local players at camps each summer at home. There was little question what Wynn wanted to do after graduating. She joined Trakh, her former coach and now coaching mentor, as his assistant at Pepperdine. She recalls one instance in which—unbeknownst to her—Trakh feigned illness so that she could have the experience of coaching her first collegiate game. “He said I could be a head coach by the time I was 30, but I didn’t believe him,” Wynn says of Trakh, who she then followed to USC, serving as the program’s senior assistant, recruiting coordinator, and head of scouting. In 2009, Wynn got her first taste of the role of head coach at Long Beach State, where, over eight seasons, she’d compile a 137-119 record and achieve smashing success in the Big West. 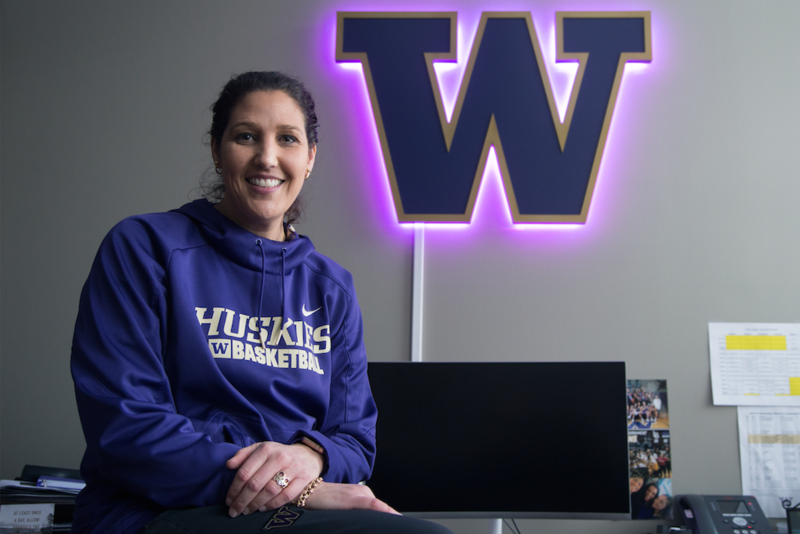 In April 2017, she accepted the head coach’s job at the UW and made the move to Seattle with her two daughters and husband, associate head coach Derek Wynn. In Washington, the Wynns inherited a team which had lost over 85 percent of its scoring and rebounding from the previous year and had just one player with experience as a collegiate starter prior to the start of the season. After a rebuilding campaign in 2017-18, Wynn says Husky Women’s Basketball finds itself “in the thick of things” in 2019, not yet at a the halfway point of the Pac-12 conference season. On paper, the team’s record is already improved from last season, but Wynn is keen on looking beyond the scoreboard in order to gauge her team’s triumphs and toughness. Wynn has stressed that there are no shortcuts on the way back to the spring NCAA tournament and that each day stands as a chance for improvement, especially within the second top ranked conference in the country—one that boasts five teams in the top 25 nationally. Last weekend, playing against Cal, Wynn’s Huskies lost by nine points. Cal’s center—widely heralded as the best in the country—scored thirty. Wynn says part of rebuilding a championship culture is ensuring her players are “pretty open” about when and whether they have or not shown that level of tenacity on court. But that’s just one part of a bigger picture. Noting that basketball has the longest season of any collegiate sport, Wynn says she believes that makes it all the more imperative that players to find outlets elsewhere on campus, even amid what can feel like a near-constant schedule of practices and conference play.